Here we have some prime early Gary Daniels in only his second-ever film role – and it delivers the goods! Director Teddy Page rarely disappoints (here he’s credited as Tedd Hemingway; note the second “d” in Tedd), and the Page-Daniels alliance – working in the great year of 1988 and in a prime location, the Philippines – is indeed a recipe for success. Daniels’s skill and athleticism as a Martial Artist is on full display, and he’s as likable as ever. This is remarkable as he maintained these qualities throughout his career. He’s teamed up with Jim Gaines, who has had an amazing career of his own: Besides Final Reprisal, he was in Cop Game, Mannigan’s Force, Strike Commando 2, Jungle Rats, Robowar, and the rare Daniels debut The Secret of King Mahis Island – and that was just 1988! Daniels and Gaines have a definite Crockett and Tubbs thing going on here. Miami Vice was super-hot at the time, and the clothes the two of them wear are a dead giveaway. Interestingly, Daniels’s first-ever screen credit was as “Male Stripper” in an episode of ‘Vice called Walk-Alone in ’86. Only two short years later, he was living the dream as a white-suited Crockett-esque lead. And while James “Sonny” Crockett was a Vietnam vet, Miami Vice didn’t feature Crockett mowing down baddies with a machine gun, going through “revenge training”, enduring the Prerequisite Torture as well as a torture montage. ‘Reprisal also contains killer fight scenes, as well as the classic guard tower falls and exploding huts. While our heroes are most definitely fighting the commies, Final Reprisal offers an unusually sympathetic look at the other side of the coin. You feel bad for Van Phu and his daughter. This gives the movie a dimension you don’t often see. 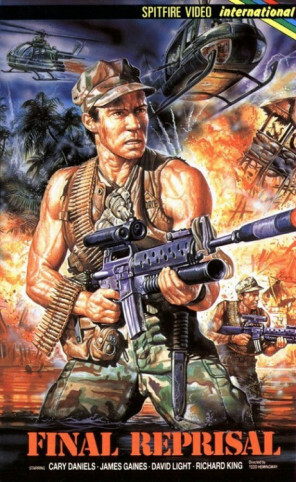 As a whole, Final Reprisal is a lot better and more entertaining than the much more well-known Missing in Action (1984). The whole outing starts with a bang and the viewer remains satisfied. It’s hard to ask for much more than that. Plus, we get a lot of the silenced-gun “pew” sound effect. This is to be distinguished from the “pew pew!” laser effect. A short, curt “pew” indicates a shooting done on the sly. We get a feast of them here, if there are any fans of that out there. Puzzlingly, Final Reprisal never received a U.S. VHS release (and, as of this writing, has no U.S. DVD or Blu-Ray editions). This is a real shame, as it could have been a video store-era classic, and it could have raised the name recognition of Gary Daniels back then. It would have been perfect for video store shelves of the day. Thankfully, it does exist, and fans of Gary Daniels and/or 80’s action have a winner on their hands with Final Reprisal. Teddy Page’s movies are always worth seeking out. This is yet another solid Philippines-shot Namsploitation movie. Where did you find this rare movie? I have the German DVD myself. Explosive Action: Loved your write-up on Blazing Guns! Always wanted to see that. Agreed: Phantom Soldiers is Teddy's best work. Roger: Can't agree more! We love Teddy Page also. We watched this on YouTube. Was lucky someone posted it. 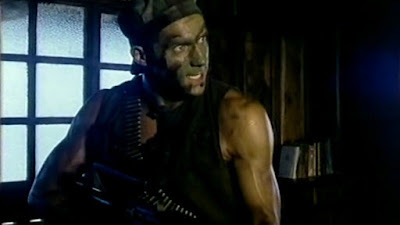 Do you have the other obscure Gary Daniels film Secret of King Mahis Island? We've looked but we can't find it at the moment. Hopefully we will.